Never attempt this activity. You will destroy your car and surely bring death or dismemberment upon yourself, your loved ones and your pets. I offer this information only for academic purposes, and am compelled to warn you that even veiwing it could put you in mortal danger. You assume all risk after reading beyond this line. The folks behind the Prius (shall we guess the lawyers, and not the engineers?) decided that nobody should be able to adjust certain things on the MDF while the vehicle is in motion. Sure, you can play with the climate control, and watch the mileage displays and do all kinds of distracting things... but you can't scroll through your music collection or use some of the bluetooth phone features while the vehicle is in motion. 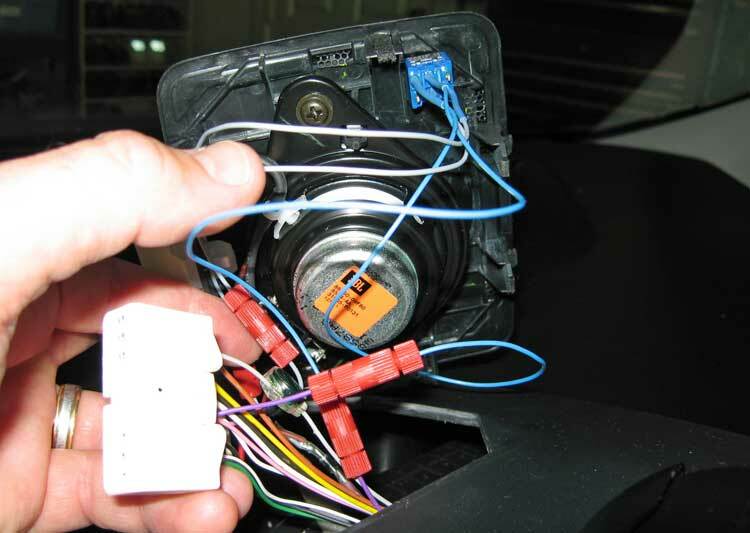 The fix, of course, is to hide the speed wire from the MFD when the *passenger* would like access to these neat features while the driver is diligently concentrating on the road. 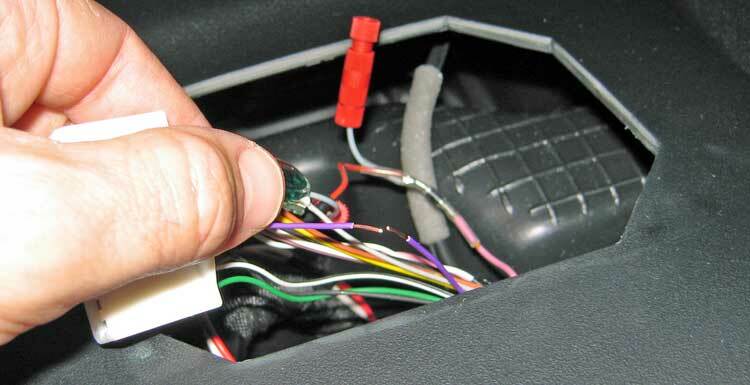 Basic job: Cut purple wire at back of MFD, and insert a switch. This project is an off-shoot of the Anytime Reverse Video mod, so looking at that will allow this page to make more sense. This one just briefly shows where that purple wire is, and some switch options. First order of business is to gain access to the back of the MFD (I went in through my favorite speaker hole again). Then unclip that same big white connector that held the wires we used for the Anytime Reverse Video mod. And snip that purple speed wire that's right next to the pink wire we used. Here it is cut and the ends stripped (you can see the diode in the background from the previous mod). 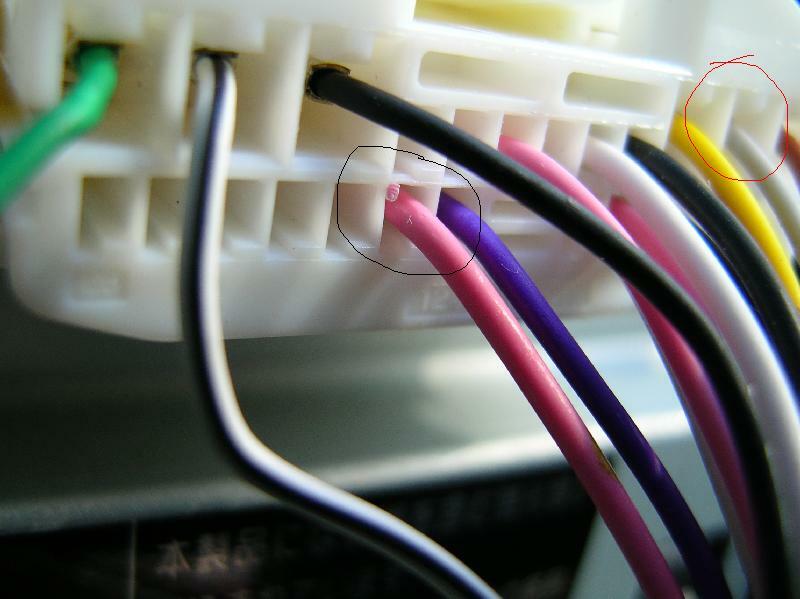 The purple wire right next to the circled pink one is the speed wire that we need to cut. My first attempt was to follow Keydiver's example and use an DPDT on-off-on switch to allow our three situations: All factory connections - speed wire interrupt - reverse video. I wired it all up, and didn't care for it much, though it worked just fine. Here was that attempt where you can see the purple wires attached to the blue wires that go to one pole of the DPDT switch. Next I popped a sister switch into the other corner of the speaker grille, and I liked this better. 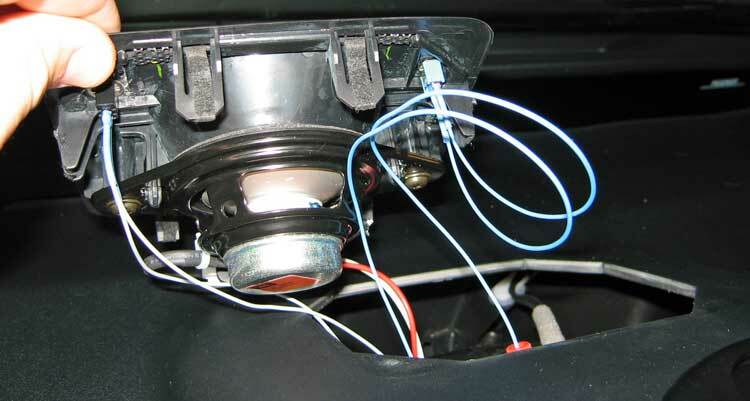 Reverse camera on the left, speed wire interrupt on the right. So here's the result: It definitely fools the MFD into thinking you are not rolling and gives access to all the bluetooth functions and audio functions. The only functionality that you LOSE with the wire disconnected is the animated rotating wheels, and the history aspect of the 5 minute rolling MPG graph. The "green car" regeneration icons still show and slide left over time, and the MPG bars will be drawn if the speed wire is reconnected at certain times. If you just blip the switch for a short while, the MPG bars don't seem to be affected. Can't quite figure out that timing! Everything else works - average mileage, instantaneous mileage (both bar and digits). No info is permanently lost except those silly 5 minute MPG bars while driving.